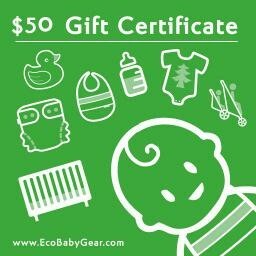 Gift Certificate $50 - EcoBaby Gear, Inc.
*Please Select "Store pick up" at check-out to not be charged a shipping expense on gift cards. Can't find the perfect Eco Baby gift? A gift certificate is the perfect gift to give any new or expecting parent. 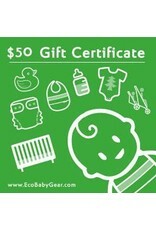 Eco Baby Gear specializes in organic, eco-friendly baby essentials. We carry a wide selection of sustainably made nursery furniture, organic mattresses, cloth diapers, baby carriers, and many other quality baby products. Call us if you need help with gift certificates or want to know more!